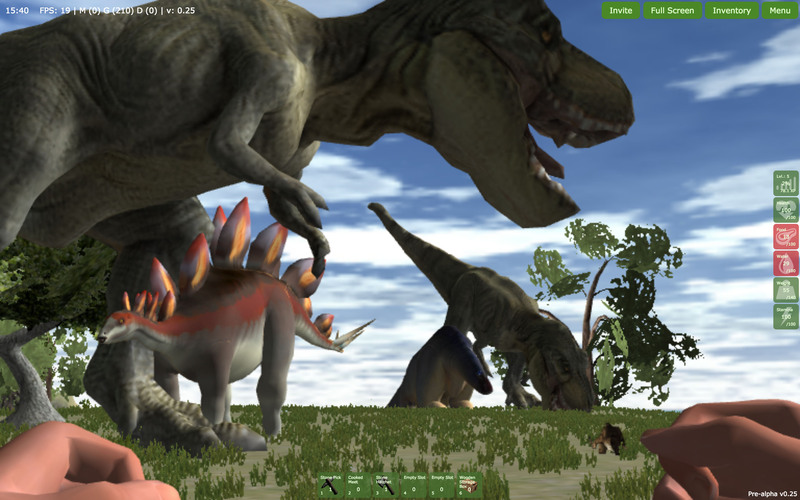 Hunt prehistoric creatures with your friends online. 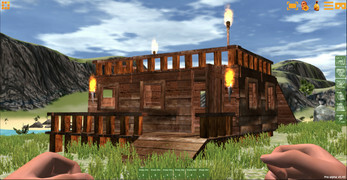 Build your own base, craft tools and weapons to survive in the first large-scale true cross-platform open world game running in your web browser. 16 km2 of Uncharted territory to Explore with Jungle, Swamp and Winter bioms. Unlock and crafts stronger and durable tools and weapons as you level up. Impress your friends and the community with the biggest or weirdest looking base you can come up with. Your friend will show up in seconds. No registration necessary, just send an invite link. New Dinos are added on a regular basis. Pick up the game where you left off on any device in multiplayer. When is multiplayer going back up? You can press "i" on keyboard or tap on the "bag icon" to open your inventory. On mobile/tablet you tap on anything to select or to do anything. There you have a Stone Pick. 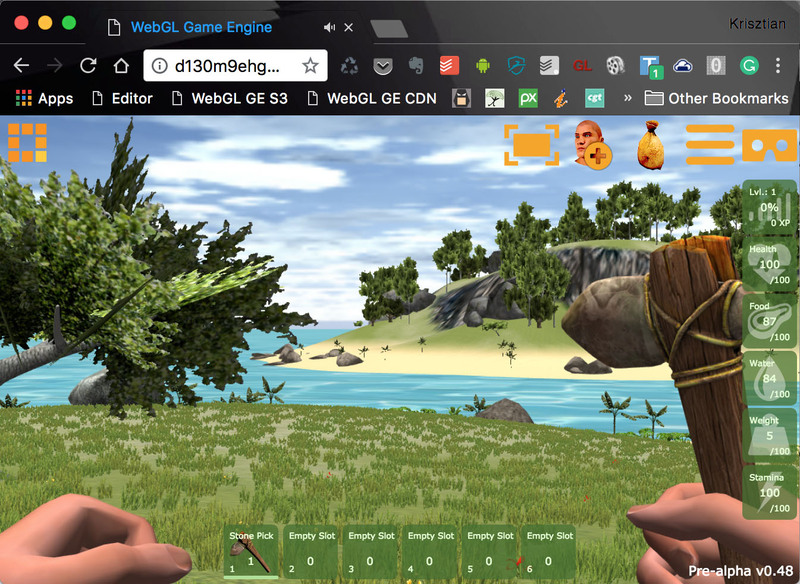 Select it by clicking on it then select any of the Quick Menu slots at the bottom of the screen. Now you can activate the Stone Pick by using 1,2..6 keys on the keyboard, depends on which slot you've moved it to. You can put it away buy selecting the same stuff again on the Quick Menu. 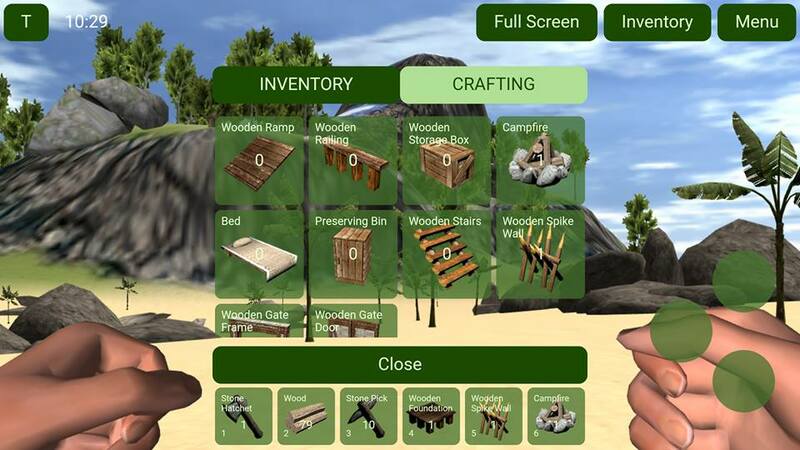 You can gather berries by hand, and wood and stone by using your Stone Pick. You can "punch out" trees and rocks now, but thats a bug. You need to move the berries from your Inventory to Quick Menu to eat them. Same way as you did with the Stone Pick. Once the berry is on the Quick Menu, use the corresponding key, "1,2.. 6" or tap on it on mobile. Stand in water and left click. How to escape/fight with the reptiles? You need a Stone Pick at least in your hand, and left click. I would keep moving back at the same time. With a Spear you have a better chance or with any higher level weapon. Some weapons can be used form further away to gain some extra hits before the raptor catches up with you. You can also outrun them by holding shift - not the Allosaurus. 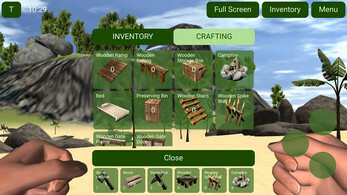 I may mention it here that you can craft by pressing "i" for Inventory then click on the "Crafting Tab" to access the crafting menu. You can also craft in certain stations, like Workbench. You open a Workbench by standing close, facing it then pressing "e" on the keyboard. Same goes for Campfire and cooking. Sometimes I got a glitch. I could went inside into a stone or go through a dino. Thanks, I'll fix that soon. If you could provide me with any details I would really appreciate it. I believe it works but Im sure I know something that is not self explanatory, therefore people can get stuck on it. Sometimes I had plain island, without any trees or stones. I think that it was because (temporary) slow internet connection. Consider catching data. Some people get this the first time they load the game, unfortunately I never experienced it myself so its hard to fix it but I will do my best to get it done soon. Again, I really appreciate your detailed feedback and if there is anything else I can help you with, don't hesitate to comment again.